Three new coffee shops have taken residency in Saco, providing a new scene for the people and streets. Saco’s historic Main Street recently has seen changes with the uprising of new businesses opening at every corner. CIA Cafe, Quiero Cafe and The Rugged Spruce are the three newest additions to the city. CIA Cafe, located on the corner of 9 Beach St., opened in January, and it is an extension of the cafe in South Portland. CIA, standing for coffee-ice cream-art, offers a variety of food and beverages for breakfast and lunch. Jeannie Dunnigan, owner of CIA, said after moving to Saco a year ago she realized that the city would benefit from a place like CIA. The decor of shop features work from 30 local artists, including Dunnigan herself. Artwork ranges from paintings to gifts, with a new exhibit on the walls every eight weeks. Owners of CIA renovated the building themselves, with help from local electricians, plumbers and sheet rockers alike. Down the road at 8 Pepperell Square, there is more to find than just coffee at Quiero Cafe. 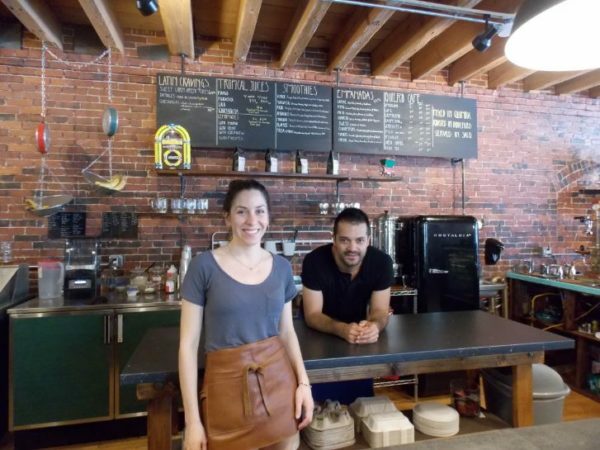 The name means “I want coffee.” The owners, husband and wife duo, Alejandra Herrera and Carlos Guzman, brought their Latin roots to the city of Saco this past May. There is a variety of Latin food offered along with smoothies, tropical juices and coffee. In the future, Herrera says they hope to expand and add beer, wine and Latin cocktails to their repertoire. The latest addition to the cafe spree is The Rugged Spruce, located at 209 Main St., which opened its doors June 24. The Rugged Spruce serves wood roasted organic Speckled Axe coffee, along with breakfast sandwiches and pastries, including Holy Donuts. Erik Squire, manager and owner, said they relocated to Saco after having a child and soon realized they missed going to the local coffee shop in town. Each cafe has a different aspect to their place, all satisfying a different niche. And Saco residents are not the only ones excited about the new additions. William Mann, economic development director for the city of Saco, said with recent development and redevelopment of properties downtown, there will be an increase of people living in Saco. “With more people living downtown, and a greater variety of things to do, it advances the likelihood of people choosing to live in Saco, and it will encourage further expansion,” Mann said. “We are hoping that our new businesses find great success and we welcome them to Saco,” Mann said. Mann and others are hopeful that these three additions can be a spur to further development of downtown Saco.